Unique Meeting Venues with a View in Raleigh, N.C. The world record-holder for largest selection of draft beer (Guinness made it official in late 2015) and passionate mind Niall Hanley&apos;s Raleigh Beer Garden is a massive 8,500-square-foot venue. Its upper floor and rooftop levels are great spots to hang out! 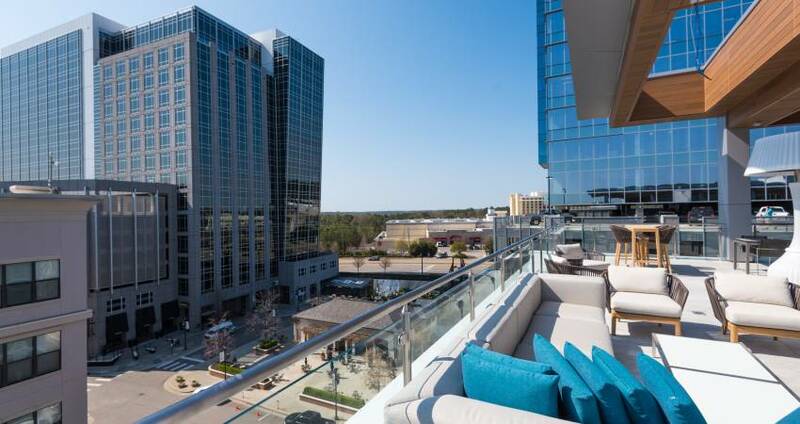 For some of the best views of Raleigh, N.C.&apos;s bustling Glenwood South entertainment district, plan a gathering for the balcony of Niall&apos;s Hibernian Restaurant & Pub. Sip on a pint of Guinness and select food from traditional Irish fare like bangers and mash, corned beef and cabbage and shepherd&apos;s pie. Also nestled in Glenwood South and owned by Niall, Solas&apos; rooftop offers space for private events. With versatile seating and cabanas the space works perfectly for corporate events and gatherings. Level7 is a 5,100-square-foot, eclectic space with a European-inspired menu overlooking the North Hills area. The rooftop bar of N.C.&apos;s first AC Hotel, AC Hotel Raleigh North Hills, this hotspot serves local craft beers, samplings from small-batch distillers and a selection of Spanish wines on tap. Even if there isn&apos;t a Wolfpack game, Vaughn Towers, overlooking North Carolina State&apos;s legendary Carter-Finley Stadium, provides an ideal location for business meetings or special events. With a range of suites and spaces, the venue can be tailored to meet a large range of specific needs. A great spot for larger groups, Taverna Agora serves authentic Greek cuisine. With culture and hospitality to match the Mediterranean feel, the modern rooftop is a local-favorite gathering spot to enjoy the evening in the open air. You can&apos;t go wrong with a Southern-inspired kitchen and craft beer bar. This new spot, from the same team behind the super-successful Trophy Brewing Company, serves a constantly-evolving choice of craft beers. The rooftop patio is open in the evenings and for brunch on weekends. An anchor in the downtown Raleigh nightlife scene for more than a decade, the space was renovated and expanded in 2012 to add more private event space plus a rooftop patio. Raleigh Times boasts a great beer selection and view of downtown. Our newest rooftop deck, 10th & Terrace opened summer 2017 in the new Residence Inn Raleigh Downtown. Overlooking a sea of green space and the Duke Energy Center for the Performing Arts, 10th & Terrace offers tons of comfortable seating, a seasonally-changing small plates menu and a local beer and craft cocktail list.